Quality Matters is a program that many institutions use to certify courses and assure their quality. If you go through their training, they emphasize that learner-learner interaction is important, and in general, creating community is important. Having students and teachers introduce each other, for example, is part of their rubric. I know our LMS (Moodle) allows student groups, and you could have a forum specifically for each small group. I’m not sure I’d want to wade through e-mail if I had to grade individual posts/items. I’m not sure it’s valuable to grade individual homework in a F2F co-present classroom. Same goes for online learning. Goes double for the large classes IMO. Students need useful, timely feedback on their ideas. They need to feel like their ideas are taken seriously. I don’t think those imply that students need responses to their every written comment. This rings true to my experience. Teachers struggle under the tyranny of the urgent. The delta in friction between using a web app and using an e-mail client is large enough to push something from the “doable” to the “nope” category when there are a million pressing demands from parents, students, colleagues, and administrators. I’ve written half a dozen comments on this blog that have disappeared into the ether because I can’t always figure out how the reply system works. Even just that little bit of friction, and I’m off to class. One thing I wonder is what that will look like in 20 years when the center of mass of adults are introduced to digital communication using a cavalcade of social media apps instead of a uniform, universal protocol. As McLuhan says, the medium is the message. I wonder if we should just stick to more real world communication tools like Slack, and use something like Notion for longer comments and file repository. I suspect that most LMS are “out of sight, out of mind” and then when they come to mind, right there with them is some “ugh, obstacle factor (in learning and navigating the LMS)”. Ive spent a tonne of time building out LMS and they’re clunky, sort of slow and not really all that natural. Email at least can feel like a personal, considered response. I wonder if we should just stick to more real world communication tools like Slack, and use something like Notion for longer comments and file repository. Seems to me that identifying “real world communication tools” depends on whose world we’re talking about. I had to take an online class this past summer. Your comments ring true: there was the forced commenting on posts. There were assignments that were tangentially related to the discussion, and graded on a rubric that had nothing do do with anything I might have learned. There were enthusiastic teacher responses in the discussion with all the sincerity of a … well, not sincere at all. It was an education class, of course, and it made me hate everything about teaching until I got into a classroom in front of kids again. I love your attempt to improve the interactions using email, but I suspect the very narrow bandwidth for feedback will doom the process. I mean, we introduced emoticons because people couldn’t properly convey emotions through their writing. Can you imagine asking a student to use emoticons to describe their level of frustration in tackling a particular concept without increasing that level in the process? I love your attempt to improve the interactions using email, but I suspect the very narrow bandwidth for feedback will doom the process. One interpretation of this comment is that written communication itself is doomed. That can’t be your meaning but I can’t figure out another one. I don’t know that writing is doomed. But writing has limitations. If we could communicate everything that we as teachers needed to by writing, textbooks would be sufficient, and teachers would be superfluous. I’m not suggesting we get rid of textbooks. I’m suggesting that the value added that we as teachers provide is difficult to do via writing. Interesting you asked that… I have seen an exit ticket where the student is asked to choose from four emojis representing “I totally it! — I think I get it — I don’t really have it down — I’m utterly lost.” I’ve considered adopting it (for occasional use) but haven’t yet done so. This is a great point. Small groups are good. Being in people’s regular routine is good. Our LMS (Moodle) allows for groups (while still allowing the option of visibility between groups) AND for replying to forums via email. This would create the higher engagement model you observed, while also allow for a central repository of posts and cross pollination between small groups for the students/instructors who are willing to visit the LMS (and the potential for structured feedback/points for the instructor). I will try to promote this method. Of course with high school students the posts need to go to Instagram, Snapchat, or a phone alert to truly be “where they are”. Thanks for sharing your data! I have a feeling that your last comment about using Snapchat, etc. might be a little tongue-in-cheek, but I’ve just been reading about Michael Britt and thinking about his Snapchat examples. I think it has to be used with care, though, because evidence of misuse disappears unlike eith rmails & texts. Our LMS (Moodle) allows for groups (while still allowing the option of visibility between groups) AND for replying to forums via email. This would create the higher engagement model you observed, while also allow for a central repository of posts and cross pollination between small groups for the students/instructors who are willing to visit the LMS (and the potential for structured feedback/points for the instructor). Is it possible for people to participate in the course without logging into the Moodle installation? Except maybe once to set it up, let’s say? Sure it can. In fact, the written word might be one of the main barriers. Writing just doesn’t feel good like talking to someone does, so people don’t like doing it nearly as much. Reading and writing also lacks potency. My father-in-law and I just had a conversation about our growing distaste for written instruction manuals. I bought a washer and dryer, for instance. The washer manual had QR codes that I could scan with my phone which took me to videos showing me how to set it up. The result was that it was almost pleasurable setting it up. The dryer, on the other hand, had no QR codes and no videos (same brand, strangely). My dissatisfaction was tangible. I was frustrated. My experience was cumbersome, confusing, and uncertain. I only did it because I had to. Reading and writing often doesn’t feel good, so people don’t choose to do it as often. The written word could be a major barrier to online course success. When there is money (especially your own money) being spent on a course or you are getting something from it (PD hours, salary raise), you are more likely to finish the course. But a sense of community and quality content is what makes people stick around even if the course is for free and they get no external “credit” for it. Really interesting data, Leigh. I imagined there was some falloff from intent to execution but not that great. I really love how many different media you folks produce every week. Live shows, recordings, email, etc. Meeting teachers where they are. I love the Global Math Dept but taking an hour on a school night to participate live is really difficult for me. So I am one of those who sign up and rarely show up. I appreciate all your work on Global Math Department! I’m the 90-95% of the people you are talking about. As an international teacher, I am not able to get up at 4am in the morning to participate in the live webinar. I participated in about 50% of the recordings that I signed up for (usually a week late), and I benefit deeply from it. Thank you for making the recordings available every week! I think an important component in the comparison between Global Math Department and online courses is the synchronous/asynchronous portion. Live online events have lower attendance. I also agree with Leigh’s point that nothing invested means nothing lost if they don’t attend. So what I notice about the data is that the first week has a larger drop in participants than the following weeks, but the drop from week 2 to 3 is approximately equal to the drop from week 3 to 4 in both formats. 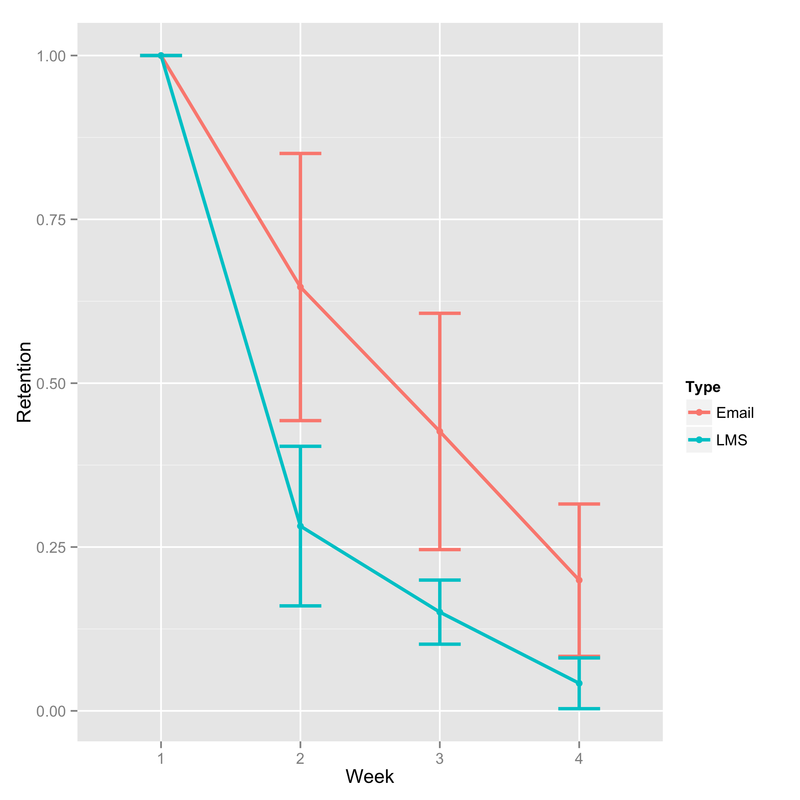 Also, the decrease in proportion participating per week is less for the LMS than it is for email. This is perhaps due to the limiting value of 0 participation. I like William Carey’s idea of the “doable” and the “nope” as the assignments are encountered in email, but the additional effort needed to find the website and remember the format for the LMS. 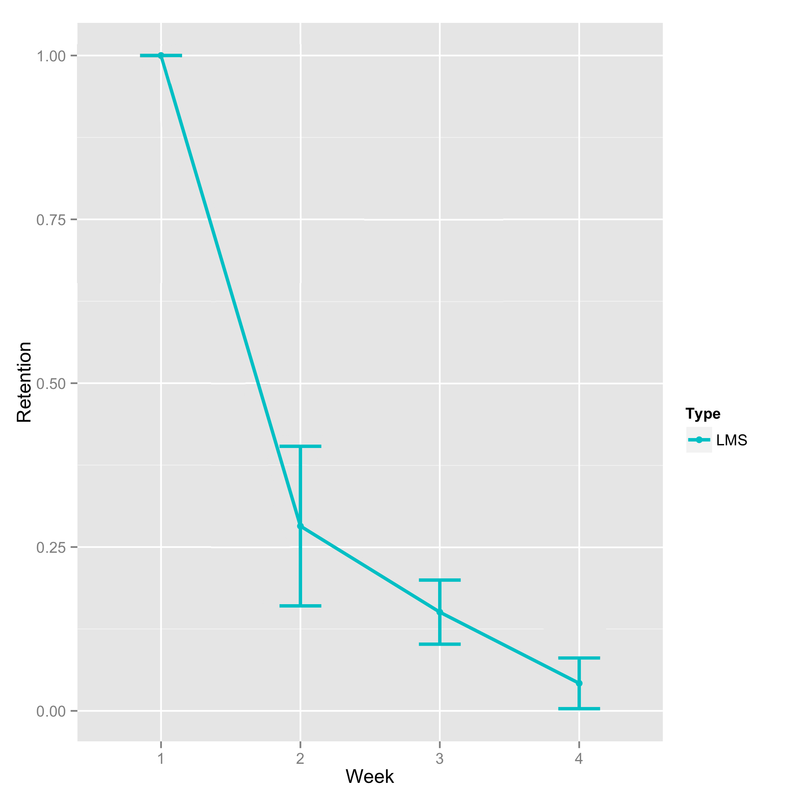 But this does not explain the lower decrease per week after the first week — unless these are those already using that particular LMS, so they may already be there, thus it is reduced to “doable” vs “nope” again. Length of reply may be related to the type of writing one is accustomed to do in each format. In the LMS, we know we are talking to other math teachers, so not as much explanation is needed. We use email to communicate with parents and perhaps students and hence might use more words to try to be extra clear. More data is needed, obviously. I also think the smaller group idea is useful, but I think it is the common interests or ideas that makes the smaller groups work. If we have small groups but no basis on which to communicate there would still be a problem. I suspect the affinity groups mattered quite a bit in the email trial. I’m currently running a randomized trial that controls many more variables. I’ll be interested to see what happens next. At the risk of sounding cliché or boastful about reaching “that one student”, how does one represent a “data point” like this one within that tiny 3%? For me, it became 100% of the reason and reward for all of the work involved. https://joanneward.weebly.com/blog/from-a-cart-pusher-to-a-math-teacher I know, I know, I’m a sappy teacher :-) and that we’re measuring different things here – it *was* disheartening to see exponential decay in participation in the online course from week to week, and I’m glad to see that a new format improved things! Cheers! Featured your comment in the post. Excellent post! I totally agree with your opinions about online courses. And the method of delivery is so stale, it’s rinse and repeat. I am finishing an online Masters at the moment, I also finished a course through Harvard Project Zero as well as EdX/MIT recently, so I know the format all too well. Now I’m avoiding online learning all together, it’s just so demotivating. This post gives me an idea. Have you read the book The Culture Code by Daniel Coyle? He tells a story of the Zappos hiring policy. At the end of your training, your are offered a bonus to quit. Maybe you could flip it. Make the course paid, with your money back if you pass. It wouldn’t inspire quality work, but it would weed out those that were never willing to put in the time and energy to begin with and give people some incentive to stick with it. Money can be a great motivational tool, especially if it means loosing some of your own. I’ve heard of that experiment in online courseware. Not sure who did it. I generally regard those kinds of psycho-social interventions as “add-ons,” useful after the the fundamental elements of the course are tuned up. This sounds fun. How do I become a part of these email-centric courses? They aren’t currently open. Just an experiment after NCTM in April 2018. Keep an eye on this space in April 2019 for something similar. I agree with you that large online classes are generally terrible. I taught a couple of them five years ago and felt zero sense of community. However, for the past three years, I’ve been teaching a much smaller online class that is a vastly superior experience. I have between 10 and 18 high school students who all videoconference (using BlueJeans) with me twice a week in our virtual classroom. We get to see each other’s faces and collaborate on problems in real time. Aside from these two synchronous hours together, I plan for around six hours per week of asynchronous activities (watching instructional videos, problem sets, assessments, etc.). I encourage collaboration and often force the students to work on problem sets with classmates from different schools and to post to the online discussion board. The logistics of expanding this model to larger classes is daunting but perhaps we could split a MOOC into small groups for weekly face-to-face virtual meetings in addition to/in lieu of emails. FWIW, I have loads more faith that a model with a live F2F component will generate community between learner and connection to the teacher. It’s the asynchronous remote courses where that feels like a more formidable challenge. 1. My kids buy toys and use them a lot in the first day. Then a rapid decrease in use. 2. People start exercise routines and diets. They stick to them for the first few days / weeks, then a rapid erosion. B) If you create something that people want to do when they see it and then want to keep doing once they start, that’s a rare accomplishment. The other large-scale, email MOOC experiment that I know of was the Peer2Peer university Mechanical MOOC. It was mostly email driven. https://mechanicalmooc.wordpress.com/faqs/. I couldn’t find any write up of results, but Phillip Schmidt might be able to share something if we pinged him… in this post: https://mitopencourseware.wordpress.com/2013/12/17/and-speaking-of-the-mechanical-mooc/ it looks like the mechanical MOOC retention by the fifth round of the course was consistent with other free MOOCs (e.g. 5-10%). So there might be more data out there to compare this effort to. People are pretty tied to their email, so it certainly seems like a promising medium for engagement. We’ve been running a series of MOOCs around change leaders for school leaders (inclusively defined–anyone who wants to collaboratively improve learning for kids), and we’ve been enjoying working with the communities that we can create online in our discussion forums. You can read some of our findings and reflections on these courses at our course reports, like: https://tsl.mit.edu/wp-content/uploads/2017/05/LIiS_Review_2017.pdf or https://tsl.mit.edu/wp-content/uploads/2017/06/DTLL_Review_2017.pdf. We’ve tried to get away from measuring completion in our courses, because the real question is whether we actually change people’s practice in productive ways that benefit students. We’re trying to get clever at answering that question. I think the future of teacher learning in online spaces involves a constellation of platforms and practices, and the most impactful ones won’t try to get all the teachers to participate, but will try to empower the most enthusiastic teachers as change agents and make it easy. for them to create blended and onland experiences in their communities. I’ve been an on and off again reader of yours for a very long time, since as far back as your initial TED talk in 2010. I have walked through and processed many of your blog posts including some articles you have written. I say all this because as I type this out, I am literally taking an online course with the exact same format as you laid out in your opening paragraphs, a course specifically on technology tools for education. In addition, the assignment for “discussion” that was assigned for this was to contribute reflections from Web sources by technology leaders (one from a blog post was permissible). I initially thought, “Oh, I’ve read many of Dan’s works, and he has a lot to say about mathematics and technology education, I will check his blog for some insight.” And for what appears to be some sort of alignment of the planets, I stumble upon a post that I empathize with more than anything. Currently, I am taking online courses in pursuit of my next level of certification. By law in the state of PA, we are required to complete a certain amount of graduate credits to earn our next certificate level. Obviously, the easiest way to complete these is participating in cheaper graduate universities that work through online courses. I find that even though it is for my benefit to complete these courses, my heart and mind are not fully invested in the work. Because it is necessary for me to complete these courses, I do participate and complete the work, however, it is not a priority to provide work that I am truly invested into, but rather, work that is sufficient for completion. I’ve often wondered, is this truly beneficial for me? Am I truly learning and providing real benefits for my students? Or is it i that as I am practicing my craft, and continue participating in #mtbos, that this is what is truly benefiting my students. It is of course necessary that I complete this work. Furthermore, it is completely practical and a more viable financial solution for my family. I think about that if indeed this structure you have used for Shadowcon were to be used for my class, what would change? I would certainly feel more obligated to provide on time feedback and more genuine feedback. In addition, I wonder how this structure would change the way we CHARGE for online courses. It is frustrating that I am paying for this kind of service that I do not overall enjoy or find particularly enlightening. I wonder if using simpler tools, such as email, benefits online course work, or inhibits renovation. Anyway, thanks for the posts and the thoughts. Thanks for the comment, Jesse. Speaking of the #mtbos I had a productive conversation with someone on Twitter yesterday reflecting on the anarchic, freewheeling energy of those PD experiences compared to the constraints of an LMS. How could one develop a program of study based on that kind of energy? At the northernmost university in the world, the arctic university of Norway, the course retention on a similar MOOC was 96% (292/305 in 2016). I watched one of her videos and didn’t understand a word of it but liked her energy! Both your courses were free. People often need the commitment of paying for something for them to attach value to it. A free course that I don’t earn credit for (university credit or recognition with my boss) quickly moves down in priority compared to something I sunk money into or get something tangible out of. Tangible is probably not the right word, but something that others attach a value to. It’s got to help me “survive and thrive” or else I won’t have time to finish it. More importantly, you tackled the big question of how do we make online training equivalent to in-person training, creating a similar sense of community for support and sharing. I’m coming to the conclusion that the online format just cannot replace or simulate real person interactions/community. I’m showing my age, but when ATM’s came first came out, the thought was that bank tellers would become obsolete. That didn’t happen. It turns out that people like interacting with other people. We realized that a split approach of both ATM’s and bank tellers worked best. They serve different people and situations and neither format meets all people’s needs, so we use both. So let’s acknowledge the limitation of online learning; it is not a good format for building the type of community necessary to help teachers improve their craft. It is good for certain types of learning. It is good for certain phases of the learning process. Combining local PLC’s with online content might become a powerful combination, utilizating the strengths of each format. Would love to think about how we could use NLP methods to automate the laborious work of highlighting interesting content within email threads. Let me know if this is of interest (will@unboxresearch.com). Thanks! The online class in 2017 was a career-changing experience to me. Without Mrs. Yenca’s Seeking students who hide class, I will never be this calm and peaceful in my career. I mean, no matter what it is – either online class or email group- I am truly thankful that ShadowCon coordinators and speakers spend their time coordinating such wonderful event for us. I am a junior teacher. Having a chance to listen and learn from experienced teachers means a lot to me. I am very blessed to grow through these awesome opportunities. Participant in the email group! I appreciate the open reflection, so my wondering is an attempt at equal reflection on my part. My wondering is whether other people dropped out for the same reasons as I did. It’s hard to continue in any kind of space, virtual or face-to-face, when you feel you are speaking into a void and, unfortunately, that’s what this felt like. I sign up for learning experiences to be engaged in learning. Sounds simple, but we all know learning is more complex than that. The curated list of reading was better than an open search on my part, so that was a definite plus — but that could have been a link at the end of the ShadowCon talk. So why sign-up for an LMS course or an email thread conversation? Because I need a space to learn where my interactions with new ideas/thoughts/material in whatever form (written/spoken/watched etc.) are met with some kind of feedback. In the newest iteration of ShadowCon extension, there was an appearance that with 4-5 members of any email thread that there is more personal opportunity for that to happen. Instead, I was met with the exact same experience of an overloaded MOOC — I was writing and no one was responding. 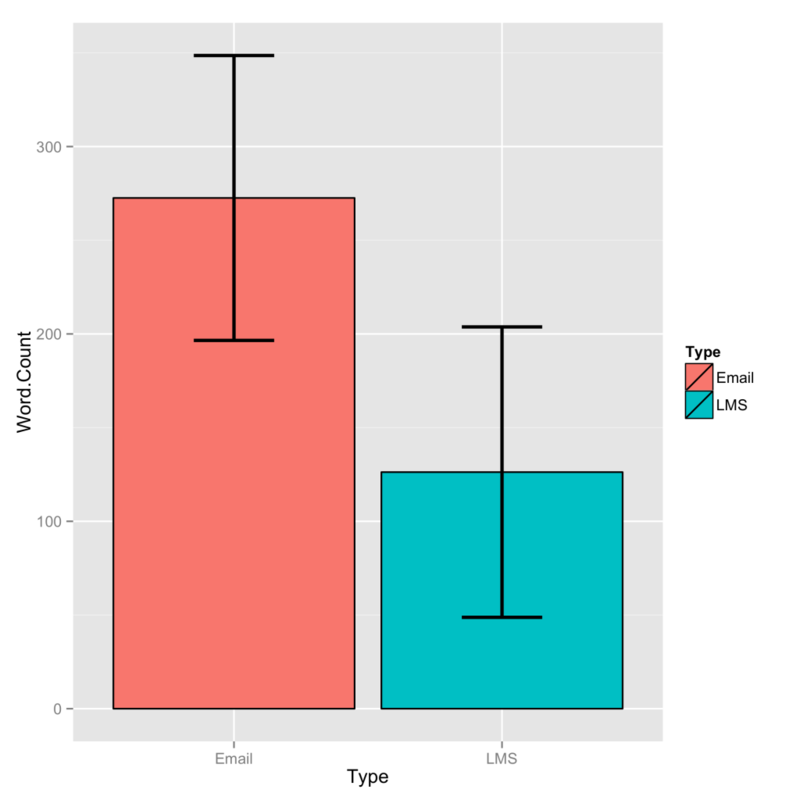 Yes, people were writing more … but did anyone read what I wrote? Obviously no one felt compelled enough to respond — is that the feedback in itself? At least in a face-to-face situation you get visual clues as to whether your statements and questions are being considered. I know I have a place in the blame here on why it didn’t become conversational. I didn’t know how to respond to the one person each round who sent out a group email — because I didn’t see anything to respond to. In person, what would have garnered a head nod of affirmation, or a head tilt of question, instead was left unanswered. So I’m curious — why continue any of these types of learning experiences if some (maybe even most or many) learners won’t actually get the opportunity to learn together? Perhaps we’re better off with a post-ShadowCon reading list and an assigned hashtag, and let Twitter analytics help provide me feedback on my ideas. Looking for more than my regular #MTBoS PLN learning here, but I don’t know if it’s possible. As much as I gained from the emailed articles and thoughtful questions, I don’t know that I’d sign up again. Super helpful to hear from one of the participants, Audrey. 1. A F2F learning experience will offer more opportunities for more nuanced feedback (including the facial tics and gestures you mentioned) than most online learning experiences. 2. The Twitter online learning experience is probably more effective than either the email or LMS options for experienced Twitter users. But maybe you’ve already answered the question! I loved the email system so much. Let me count the ways. 3. The small group was great because it felt very real and human. 3a. I knew these two teachers were actually going to read my entire email, give it actual thought, and probably reply… versus the Twitter/disqus/etc model of people scrolling casually through dozens of super-quick comments, upvoting some eye candy, and maybe dashing off a smiling sentence or two. 3b. Large groups (including the mtbos) come to focus on several superstars, which is great when I want inspiration but subsequently feels hollow when I want fellowship. I like to process inspiration by talking it out. I could, in theory, start a reflective blog, which might or might not get eyeballs… and even if I did and it did, that’s still less real, less rich, than exchanging emails with a very few colleagues. Rivka, thanks for sharing your experience. Obviously, it’s exciting to hear about anybody having a good time in professional learning online. Your experience, while more positive than Audrey’s above, speaks identically to the challenge of cultivating community online. Your emails were read and hers weren’t. That’s an interesting challenge. This is an amazing comment. I’m trying not to sound ironic here, but I’d love to hear your thoughts more often, even if on imperfect forums like blogs and twitter. I gather you don’t have a blog. Twitter handle? As a lifelong learner and educator as well as homeschool parent, I’m thirsty for new techniques to teach my son and stumbled onto this blog and q&a response about online courses. I feel compelled to throw out from my own learning experiences and watching my son learn on various platforms like outschool.com and thinker meetup as well as co-op situations and one on one tutorials, that once a community has been established by a consistent F2F encounter whether a weekend in person workshop, online platform like Zoom or the like over a course of a few weeks, then my ability to predict tone and hear my familiar classmates/colleagues voices in my head while reading an email or post by them as well as increase my interest in what they are saying goes up exponentially and can be more engaging (addressing Audrey’s wishes/needs) as well as feel like I’m not speaking my thoughts into a void. It reminds me of some continuing education choices for graduate studies and certifications that I have participated in where students meet at a physical location to study/workshop/receive lectures together once a month over a weekend and then work independently or together on projects in the in between weeks to share with each other at the following physical meetup. I would agree with Sue that a mix of F2F with online platforms could help solve the retention rate as well as charging some fee to the course offering no matter how nominal and when possible link continuing education credits to a course offering. That particular mix of F2F and online instruction sounds extremely interesting. Thanks for naming it, Laura. That Isn’t a Mistake	What Does Fluency Without Understanding Look Like?